Still bearing the founder’s name, Thibaut (pronounced Tee-Bo) was founded in New York in 1886 by Richard E. Thibaut, an American of Parisian descent. Once heralded as the “world’s largest wallpaper company” Thibaut began as a successful retailer and with multiple distribution points in Boston, New York and Newark. Three generations of the Thibaut family owned and managed the company before it was sold to its employees. RPM, a manufacturer of specialty coatings purchased the company in 1976. In 2005, management and The Riverside Company became the owners, and since June 2014, management co-owns Thibaut with Champlain Capital. 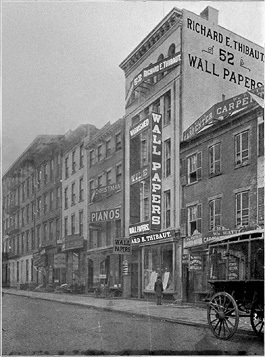 Thibaut is proud to be the oldest continuously operating wallpaper company in the United States. Over the years Thibaut has transitioned from a wallpaper editor and distributor to an upscale design house, but still operates as a close-knit, family oriented company. Printed fabrics were introduced in 1960 and more recently the line has expanded to include a wide variety of embroidered, multi-purpose and woven upholstery fabrics. While remaining true to its history and legacy, Thibaut has continued to expand and further serve its network of designers and showrooms worldwide. Anna French, a luxury brand of wallcoverings, fabrics, embroideries and Scottish lace was acquired in 2007. Thibaut Fine Furniture was introduced in 2012 as the latest chapter in Thibaut’s long history of great design. Richard E. Thibaut opens the doors of Thibaut in the same year the Statue of Liberty graced the New York harbor. Thibaut and his staff opened their ﬁrst storefront in New York City and the Coca Cola Co. is founded in Atlanta. Prior to the invention of the delivery truck, Thibaut delivered wallpaper by horse and buggy. This cheery pattern evokes the importance of the homestead as soldiers return from WWII. Barbie makes her debut at the American Toy Fair, while Thibaut Murals gain immense popularity in American homes. Clearly, Woodstock wasn’t the only groovy thing going on. Film Forrest Gump, winner of six Academy Awards, features two Thibaut murals. Thibaut introduces a dedicated line of upholstery weight woven fabrics. Thibaut introduces Thibaut Fine Furniture.